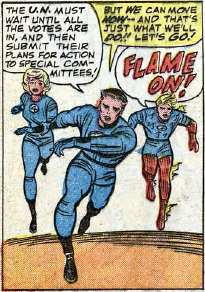 Invisible Girl | The Fantastic Flame On! Sometimes, it’s the less-flashy things that catch my eye. I really get the feeling that Sue, Johnny, and the reader, just happened to stumble upon Reed as he was making his way through Diablo’s castle. There’s no showing off, no intimidating his enemies, just a guy using his powers to do a job. It’s very casual and understated, and I really like it. Ah, good old blank backgrounds. The sign of an artistic shortcut. 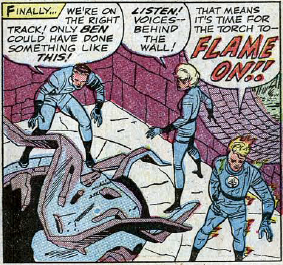 Based on this panel alone, I have no idea where the Fantastic Four currently are. I mean it. I browse the comic for these posts visually, I pay little attention to the actual plot. I think they’re still in Transylvania, but so much has happened over the past few pages, that I’m not sure. And by ‘so much’, I mean that Diablo has enchanted the whole world, re-seeded the African desert, done lots of dirty deals with tinpot dictators, un-cured the Thing and entrapped him, and enslaved the populace of the town near his castle. He’s been busy, and the Fantastic Four have… just let this happen? Way to be a super-hero team, guys! 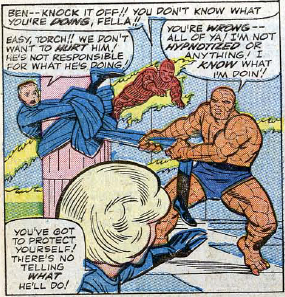 It’s hard to work out just how Ben was able to knot Reed around the pillar so effectively. I can’t quite imagine that Reed would have been this pliant, or that he couldn’t undo the knotting all by himself. Still, it makes for a nice, fun, energetic image. Or, it would, if it wasn’t for the strange depiction of Reed. We’re still in the era when Jack Kirby would happily use 6-9 panel pages, resulting in his art feeling more cramped than we are used to seeing it today. But there’s an almost complete lack of definition on Reed’s face, presumably as a result of trying to fit the entire Fantastic Four in a 1/6th page panel. It’s unfortunate, but it really throws off the entire image. Not that I’m avoiding writing about today’s panel at all, oh no. Reed, Johnny and Sue are on the trail of Ben, who has gone missing in the middle of night, leaving only a trail of destruction leading to a mysterious abandoned castle. Johnny’s ‘Flame On’ leads to his contribution to the tracking – melting through a thick stone wall to see what’s behind it. I have no idea what’s going on with Reed on this page. On first glance, it’s pretty simple – he’s using his stretching powers to get above the undergrowth to see ahead. But on closer look, things just don’t seem right. Reed’s belt line is depicted as being below Sue’s crotch, when he’s normally depicted as being taller than her. So, should I presume that in order to stretch his upper body, Reed had to shrink his lower? Normally, Reed maintains the general proportions of his body whilst stretching. If using his body to bridge the gap between two skyscrapers, his beltline will remain at the middle of his body, and his limbs will maintain similar sizes. I’m really not sure why he’s chosen to ignore those proportions here – just look at the difference in size between his two arms – but it’s unsettling to see him break the ‘rules’ of his stretching. I’ll try my hardest not to post full, consecutive pages of these comics. Splash pages seem like fair game, story pages less so. 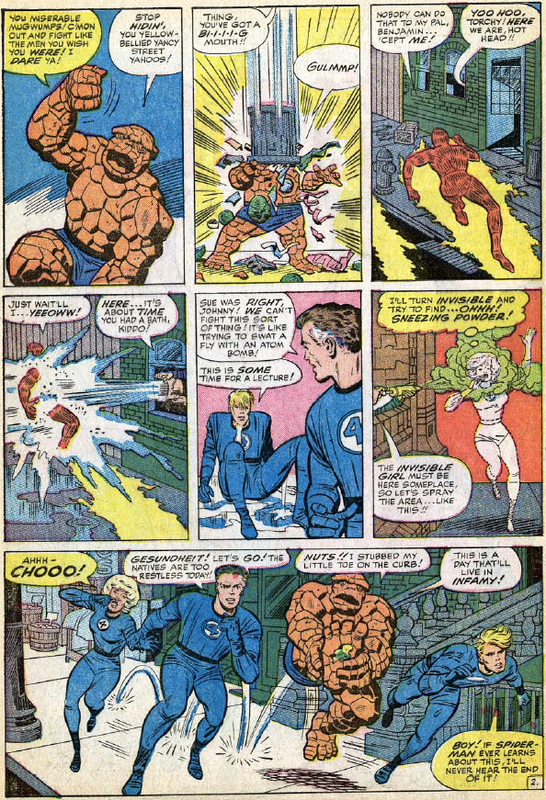 However, I’m doing this today because this is the first time the Yancy Street Gang has taken on the entire Fantastic Four. As I’m sure anyone reading this knows, the Yancy Streeters focus their attentions on Ben Grimm, but it’s clear here that if the FF head onto their turf, then the entire team become fair game. So, in short order, we get a trashcan, a pail of water, and some sneezing powder (purchased, no doubt, from the small ads in any Marvel Comic!) used to see the heroes off. It’s a scene that works really well. None of the pranks are truly offensive, none are illegal. Kirby and Stone enjoy the physicality of the humour, from a bedraggled Johnny to a hopping Ben. It’s a bit touch-and go as to wether this splash page really counts as a prank. Technically, it’s ‘littering’ and ‘defending your turf’. 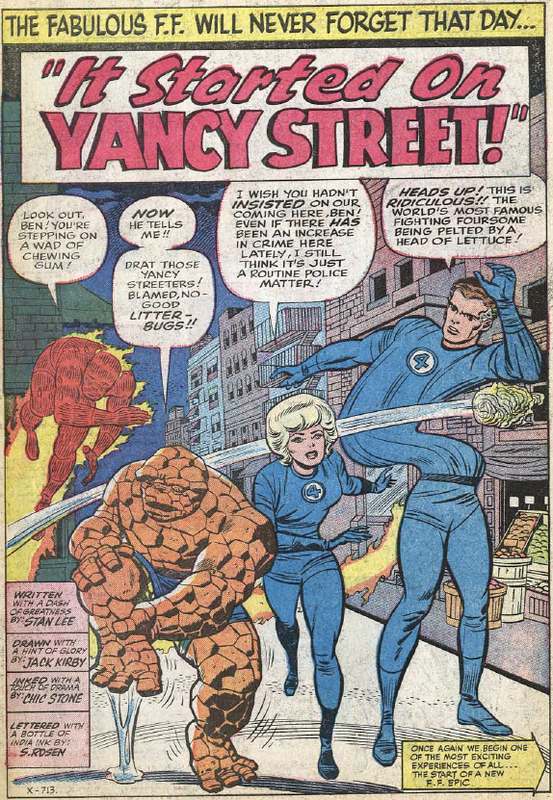 However it’s the first time the Fantastic Four have ventured down Yancy Street itself (previously, the Thing had stood at one end of the street holding up a flattering picture of himself), and that felt like it warranted a mention. More appropriately, it’s the first page to feature inks by Chic Stone, who instantly displays his strengths as an inker and set himself apart from his predecessor, George Roussos. Where Roussos favoured a heavy, chunky line, Stone’s inks over Kirby’s pencils would be defined by the lightness of his line, especially when it came to scenery and background. He also provides stronger definition for the main cast – check out Reed’s cheekbones or how Johnny’s ‘flame-lines’ hint at a more detailed musculature than had previously been depicted. 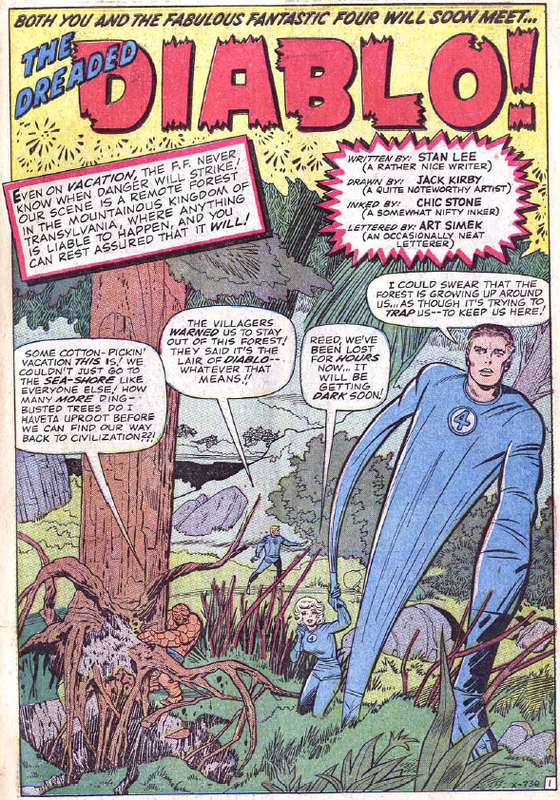 It’s no secret that Stone is one of my favourite Kirby inkers, and although he would spend less than a year on the book, he was a valuable part of the title’s transition from the earlier, experimental and improvised feel into the Fantastic Four truly becoming the World’s Greatest Comics Magazine.